Being able to finally go up on en pointe is probably one of the most exciting milestones for every ballet dancer. Pointe ballet is a beautiful dance style that requires a lot of hard work. Getting the body ready can be quite challenging. After all, it is not just the feet that needs to be strong enough for pointe work, but the rest of the body and mind as well. No matter how exciting pointe work is, there are some factors to think of first. It is recommended to be under the supervision of a qualified dance teacher when trying to learn pointe work for the first time. At Music and Dance Academy, we are proud to bring together a community of distinguished international faculty that offer personalized attention through all kinds of classes, may it be private, group or ensemble. Here are some other points to consider when planning to embark on the journey of learning pointe ballet.  It is not for everyone. 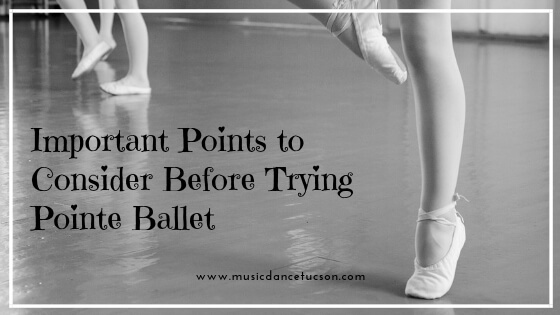 Before you can take up pointe ballet, do take note that there are certain criteria that should be met first.  Only those who are of age 11 years and up can take up this course. This factor is highly important because doing pointe work requires enough strength. Normally, children below the age of 11 have not yet fully developed their bones to support their weight.  You also need to take up at least 2 years of strict ballet training. You should be able to demonstrate first the correct posture, alignment and strength before you can be allowed to practice pointe ballet.  Pointe ballet is not as easy as it appears. Standing on your toes will surely make you feel a lot of pain and discomfort. It is common to get blisters and sores along the way. Dancing ballet as it is takes a lot of hard work. Pointe ballet is another thing. For it to work, you will need all the support you can get. Take the next step with us at Music and Dance Academy today!